It's too easy to write off Instagram's launch of Instagram Direct as a response to Snapchat. Kevin Systrom, a 29-year-old co-founder of the 150 million-strong image sharing service, has much bigger plans. Interestingly enough, he's thinking of the estimated 4 billion feature phone users worldwide. "So, what's the opportunity today, if there are only 1 billion smartphones," Systrom asked rhetorically to a room of reporters that looked as if it were ripped from the most hip Instagram shot. "You've got to imagine that, over time, people will shift to smartphones, and we'll see an even more meteoric rise in how many photos are taken in the world. And that's all about communication - that's all about sending photos to other people." With the smartphone revolution arguably still a nascent one, Systrom is thinking about how the general masses share photos with friends privately from their phones. If it's on a feature phone, that's likely through SMS, or text messages. It'd be fair to wager that most of the 1 billion smartphone users globally do the same. More importantly, Instagram wants to offer a service that solves the issues with using SMS to share photos among friends while mobile. Instagram Direct is definitely a v1 release, so to speak, but it might already be better than texting in many regards. "In text messages, there's a thread, and you basically have to go back and forth," Systrom tells TechRadar. "You can send one, and then you're typing a bunch, and then maybe someone sends another image - it's much more of a conversation." "This is, 'Let's make the image the cornerstone of the conversation and be the main attraction.'" SMS has long been the most immediate way to get a photo to your contacts in private, but, as Systrom points out, the message thread isn't always about the image. "If you ever, on an iPhone, tapped into an image that someone sent you, if you swipe back, it goes to the last image that they've sent you," the Instagram head says. "There's no continuity." Also like SMS threads, Instagram Direct photos last as long as you want them to, allowing up to 15 people at once to comment on an image and return back to them. What could even further differentiate this feature from texts would be the ability for any user in a thread to invite other friends into the discussion. "We've heard that request from our team, and we'll probably hear it from users," Systrom admits. "I think we'll have to decide when and how." With services like Facebook Messenger, Twitter and now this, reporters have long asked whether the end of SMS is nigh. Probably not, but Systrom seems hopeful that folks clinging to texting for this purpose might consider Instagram Direct. "What we wanted to make sure Instagram Direct was was much more of a timely experience, and I think that is very differentiated," Systrom says. "That being said, I don't think this replaces text messages, but it will just be a new, fun behavior." 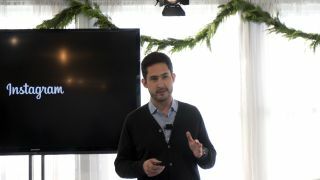 Systrom humbly points to Instagram Direct as a fun, new and probably better way to share selfies or shots of brunch with your friends, but with 4 billion potential users in the back of his mind. Still, that Snapchat is pretty hot.